PHOENIX — When you’re talking about 20 million mourning doves criss-crossing Arizona’s skies on opening day, versus the usual 30 million or so, what’s the difference, really? In fact, Arizona’s dove hunters won’t even notice the drop-off when the 2018 season begins Sept. 1. “The first half of 2018 was an extremely dry year,” said Johnathan O’Dell, small game biologist for the Arizona Game and Fish Department (AZGFD). “Based on what we’re seeing in the field, mourning doves may not have pulled off as many nests as usual. Early estimates are that most doves pulled off three or four nests, instead of the usual five to six nests. “So what does that mean? Well, you still have to consider the scale we’re talking about. A down year like this one means there will be about 20 million mourning doves on opening day, instead of 30 million. Once again, the greatest number of doves – and dove hunters — will be concentrated in the state’s agricultural areas, particularly those that produce small-grain crops like wheat, barley, oats and sorghum. For hunters who prefer a little more elbow room, now is the time to scout desert locations for water sources. O’Dell said white-winged doves are still abundant in most areas and call counts remain high. All of that could change, however, depending on monsoon weather patterns over the next couple of weeks. AZGFD reminds dove hunters to review the “2018-2019 Arizona Dove and Band-tailed Pigeon Regulations,” which are posted online at www.azgfd.gov/dove. The regulations have been produced in a format that hunters will find particularly handy in the field. The color brochure is easier to read and features important hunting information, such as season dates, daily bag and possession limits, and legal requirements, at a glance. The printed version is available at all department offices and more than 200 license dealers statewide. 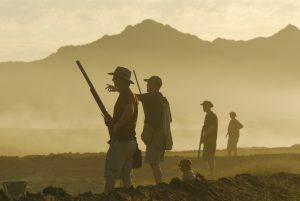 Hunters age 18 and older need a valid Arizona Hunting License ($37 for residents) or Hunt/Fish Combo License ($57 residents, $160 nonresidents), as well as an Arizona Migratory Bird Stamp ($5). Hunters age 10-17 only need the Youth Hunt/Fish Combo License (only $5 – residents or nonresidents). Persons under the age of 10 can hunt dove without a license if accompanied by a licensed adult age 18 or older. (No more than two unlicensed children may accompany any license holder). The bag limit is 15 doves a day (mourning and white-winged doves combined). No more than 10 per day can be white-winged doves. There is a 45-bird possession limit after opening day. Eurasian collared doves have no bag limit or possession limit. If you’re an adult who typically buys only a hunting license, why not not enjoy the “Best of Both Worlds” and purchase a combo hunt/fish license? For Arizona residents, it’s only $20 more than the price of an individual hunting or fishing license. For more information about why you should purchase a combo license, visit https://www.azgfd.com/bestofbothworlds/. All licenses (except short-term) are valid for 365 days. For everything else “dove,” visit www.azgfd.gov/dove. Also, check out O’Dell’s video that demonstrates two techniques for field-dressing doves at https://www.youtube.com/watch?v=5DDRZGPzJDI.